Sanitation is an incredibly important aspect of a serious recovery operation. There are times we literally live on site for weeks at a time to recover your business. Obviously, services are needed to manage restrooms, provide water, and collect waste. Our Sanitation Services cover the entire array of on-site sanitation demands. 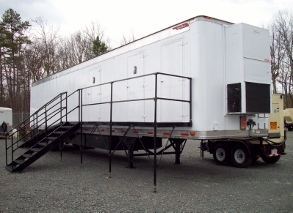 Not only do we provide your basic Port-a-john, we also offer entire mobile restrooms complete with shower capability. From the basics of washing hands to more complex sewage pumping and refuse management, we literally take out the trash. Our authority and experience is unquestioned in the industry. Disaster recovery and business continuity is our specialty – we manage emergency situations for a living. CAPACITY…5 Megawatt instant generator capacity (with more available).